Social media can give fundraising efforts a boost. 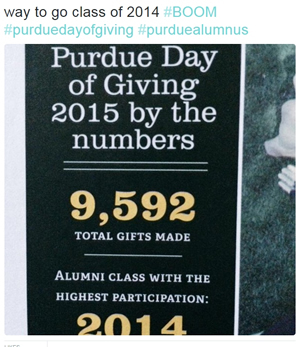 In 2015 Purdue University's second annual "Day of Giving" raised an estimated $13.7 million during a 24-hour online social media-based event that encouraged students, faculty, staff, alumni, donors and friends to contribute to the university. That fundraising result put the university's "Boilermakers" at the top of the stack in a ranking compiled by technology consultancy Kyle David Group for "record-breaking" higher ed crowdfunding campaigns during 2015. Increasingly, social media and crowdsourcing is being used by schools to call out to alumni, share community stories and, most importantly spark donations. According to a 2015 survey, six in 10 higher ed divisions (63 percent) are doing some form of crowdsourcing to raise money. Columbia University, for example, pulled in $12.8 million in its fourth annual "Giving Day," by running socially-powered challenges to people attached to individual colleges and schools and then paying out bonuses from a $200,000 prize fund to those same divisions based on their percentage of the total raised. Columbia's engineering school raised more than a million dollars, representing 9.2 percent of the total and in return received $18,383 or 9.2 percent of the prize. In total, the university reported 13,090 gifts from that single October day. Ohio's Miami University used its August "move-in" day, when the incoming class of 2019 arrived on campus, to spur its community to give under the tagline, "They unpack. We give back." People used "#MoveInMiami" to share their stories and encourage others to make donations. The school awarded participation prizes throughout the day under that hashtag on Facebook, Twitter and Instagram. The campaign raised $673,000 from 3,281 donors worldwide. Rensselaer Polytechnic Institute ran its second RPi Day simultaneous with the traditional Pi Day, which takes place on March 14 (3/14) every year. Students were encouraged to post personalized thank you videos on YouTube, which were shared via social media using "#RPiDay15." The record-breaking results: $260,614 from 1,206 donors. Florida Institute of Technology used the national "Giving Tuesday" day, December 1, 2015, for its first interactive, online outreach to alumni. Using a platform developed by the Kyle David Group, the school generated 1,499 donations from people in 63 countries, each of which was displayed on a real-time, online leaderboard. The goal isn't the size of the gift, it's the level of participation. As Florida Tech President and CEO Anthony Catanese said in a prepared statement, "The goal of the day is to encourage participation from as many alumni and friends as possible." Many institutions choose ingredients for their campaigns with relevance to the college. Muhlenberg College in Pennsylvania sought 1,848 separate donations in its November event, to mesh with the year the college was founded. The moment that goal was hit, the school upped the ante to the current year, 2015. Social powers the entire effort and reaches a constituency that may not pay attention to more traditional fundraising endeavors. Institutions use unique hashtags and encourage givers to go viral with their giving activities and stories. Behind the scenes, fundraisers set up a "social media war room," as a profile of Purdue's giving day explained, in order to stay on top of user-generated content such as selfies and videos and engage with givers. In spite of the virtual nature of these ventures, it doesn't hurt to get physical with giving activities too. As part of that record-breaking Purdue campaign, the community participated in on-campus events, such as free food, a zipline and College of Science department "goodies." Campbell University, which ran its second giving day in October during homecoming, distributed orange tags in its alumni magazine and issued them to current students to stick on "anything that represents Campbell to you." People were encouraged to take a selfie that included the tag and post it online. Simultaneously, the four-person advancement team went around and placed a version of the tag on buildings and other items "that wouldn't be here without donor support."